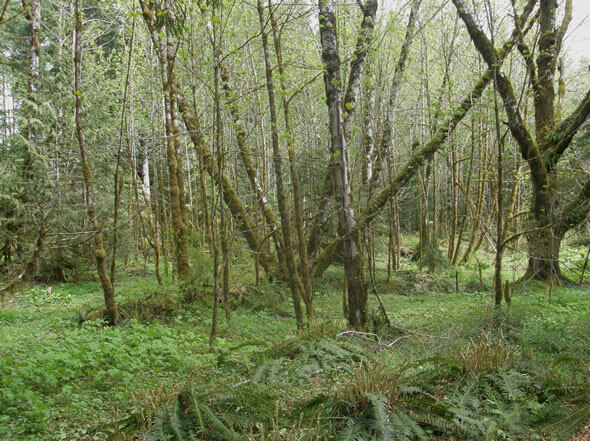 The lushness and greeness of the temperate rain forest welcomes in the spring. 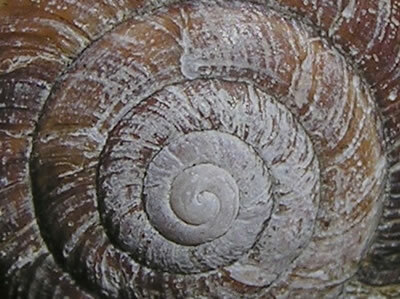 Hello and welcome to the April's issue of Whispers, the newsletter of the Dereila Nature Inn - your virtual nature centre. We hope you enjoy this month's collection of photographs, ideas and trivia. Many thanks for subscribing and supporting our project. Which animal's teeth are so sharp that Native Americans once used them as knife blades? Here are 20 flowers that have been featured as flower of the month. We have a second interactive crossword this month. See how well you can identify these 20 flowers that have also been chosen as flowers of the month. Not too far from the bright lights of Las Vegas is a fascinating place of desert tranquility. 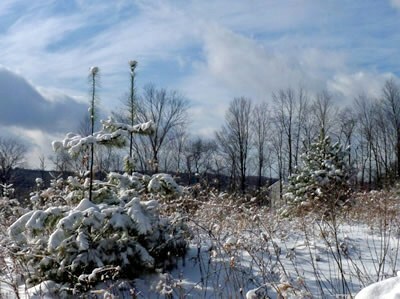 Take a virtual tour of the park, the latest in our series of Special Places in the Natural World. We invite you to submit nature photographs to this section. This month we have another great selection. 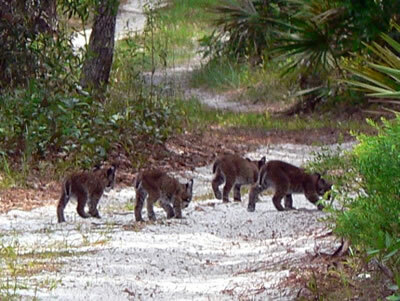 This cute image of bobcats is a rare sighting. 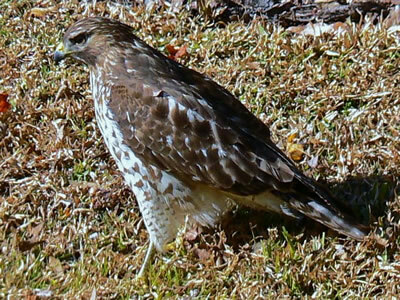 Marilyn also sent in this great shot of a hawk. 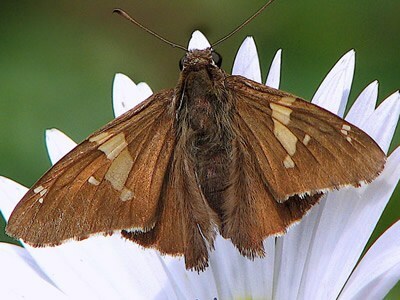 photograph of a Silver-spotted Skipper, Epargyreus clarus. Julie has sent us images for past newsletters. 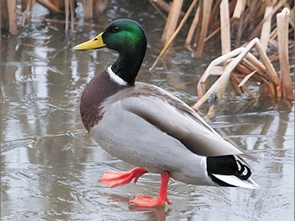 These two mallards walking on water were sent in by Laura in South Edinburgh, Scotland. 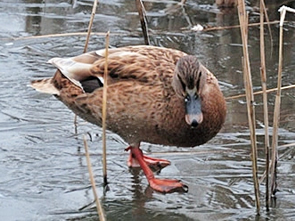 The male is on the left and the female on the right. Excellent shots taken on a cold day! Many thanks to Marilyn, Julie and Laura for your wonderful photographs! Bug - Melacoryphus lateralis; Wildflower - Desert Verbena; Bird - Great Egret. This month's choice from the Lagoon Trail seaction and is a feature called "From Beneath the Waves." Encounter some zooids, a Turkish Towel and some Feather Boa Kelp in this exploration of interesting seaweeds and rockweeds. Just click on the image to visit the page. 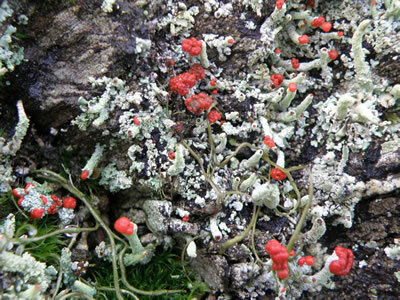 image and came across some interesting lichens. is the fungi part of the lichen and is ready to send forth its spores. A close-up shot shows a beautiful miniature garden. 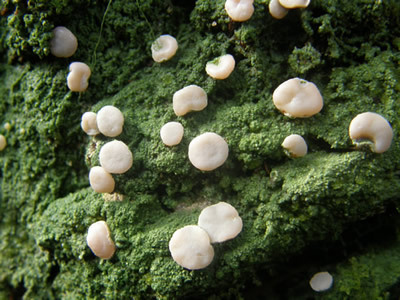 The spores of the fungi will disperse and germinate into new fungi. Number one: "Okay. One picture and then I take the treat." Number two: "Are you sure I can have it?" with a brief explanation. We look forward to your ideas and submissions. 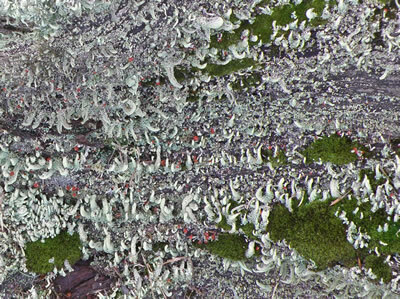 This photograph of Peppermint Drop Lichen, Icmadophila ericetorum, was taken in the moist rain forest. Icmadophila comes from Greek words "ikmas" (moisture) and "philos" (loving). The species name, ericetorum, is from a Latin word "erica" which means heath and refers to the acidic habitat this organism likes. 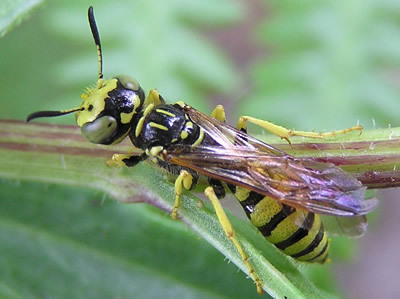 A man went to the casualty department of a clinic and said to the nurse, "I've been stung by a wasp. Have you anything for it?" "Where abouts is it?" asked the nurse. The guy responded, "I don't know. It could be miles away by now." "I swear it wasn't me." We invite you to post comments, suggestions and participate in discussions on our new Facebook page. To visit, just click on the logo or here. It's egg laying time in the bird world and you can help out a bit by providing birds with a little extra calcium for their egg shells. 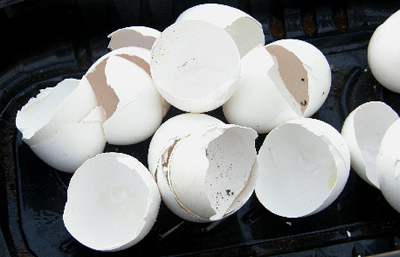 A good source of calcium can be found in egg shells used in the kitchen. Instead of throwing them out or putting them in the compost, just rinse them out and bake them in an oven for a short time, but don't brown them. This sterilizes them and makes them extra brittle. Place them in a bag and roll them with a rolling pin or a bottle until they are crushed into very small pieces. 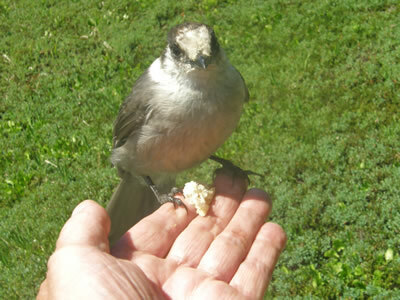 Next, simply mix the crushed shells in with the seeds that you put out at your feeding station. Continuing with our nesting season theme, it's time to give the birds another helping hand with their nesting materials. Collect some hair, wool, fluff, lint, moss, lichens and other similar soft material. Stuff everything into an empty suet feeder and hang it in the garden or on the sundeck where you can watch the birds help themselves. 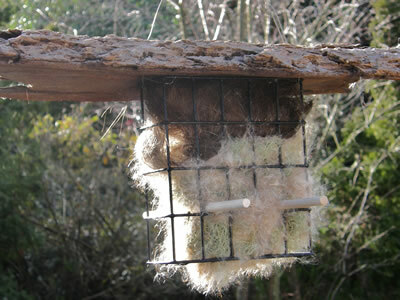 You can go back to placing the suet blocks in the container later in the year. We are still in search of a few butterfly images to complete our state butterfly page. If you can contribute any of the following, it would be appreciated. Arizona: Two-tailed Butterfly; Arkansas: Diana Fritillary; New Hampshire: Kramer Blue Butterfly; New Mexico: Sandia Hairstreak; Wyoming: Sheridan's Green Hairstreak. You can see the page by clicking here. 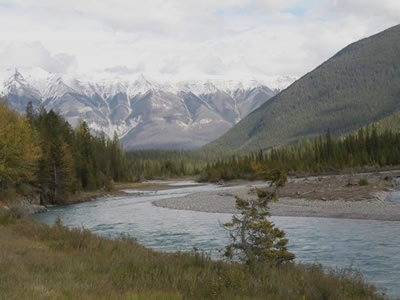 The mighty Kootenay River starts its long journey of almost 500 miles/800 km high in the mountains of Canada's Kootenay National Park where this photograph was taken. Becoming bigger and bigger as it goes, the Kootenay travels south into the United States where is it called the Kootenai. It meanders west and then northwest back into Canada and eventually drains into the Columbia River which takes the Kootenay's waters south back into the United States once again and then west all the way to the Pacific Ocean. During its course it will flow over dams, pass through mountain valleys and be parts of long, deep lakes. 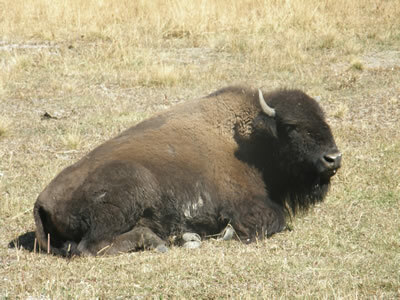 Did you know that the American Bison, Bison bison, is the largest terrestrial animal on the continent? Grazing primarily on grass it can grow to a height of 6 ft/ 1.8 m and weigh up to 2000 lbs/900 kgs. Females are usually somewhat smaller. 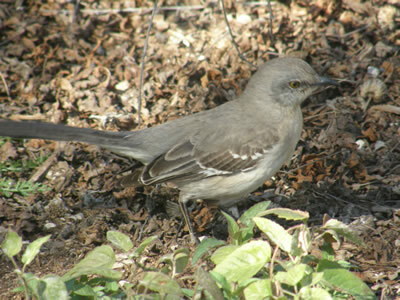 state bird of four states: Arkansas, Florida, Tennessee and Texas. You can view more birds in our collection of state and provincial birds by clicking here. 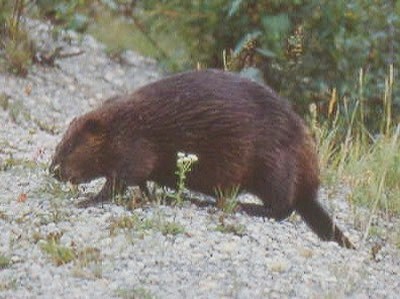 The North American Beaver, Castor canadensis, has super sharp teeth. This month's mystery picture was an easy one! 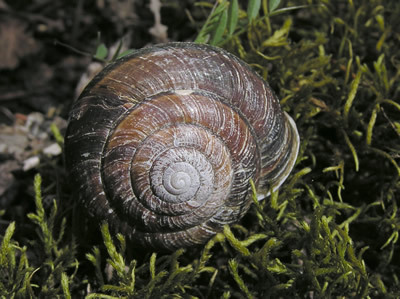 It's the shell of a common snail. We hope you've enjoyed this month's newletter and we hope you'll forward it on to your nature-loving friends. Your ideas and suggestions are always welcome, send us an e-mail. Watch for the next issue of Whispers in your inbox during the first week of May. See you then!